Second team indoor All-American … Posted a PR of 4,278 points in her first pentathlon of the season at the Razorback Invitational off a shot personal best (40-7.50) and a long jump indoor personal best (20-3) … Her pentathlon mark from the Razorback Invitational earned her the No. 6 spot in program history … Scored five points in the pentathlon at the SEC Indoor Championships assisted to a fourth-place finish with an indoor 800 PR of 2:23.51 … Qualified for the NCAA Indoor Championships in the pentathlon … Narrowly missed the podium at the indoor national meet, finishing three points behind the eighth-place multi … Jumped a lifetime best of 20-6.25 in the long jump during the outdoor season, which led to a heptathlon win at the John McDonnell Invitational … Earned five points and set a PR of 5,820 points in the heptathlon at the SEC Outdoor Championships off a season-best the 200 (23.91) and a personal best in the javelin (115-11) … Qualified for the NCAA Outdoor Championships in the heptathlon; season ended with a misstep in the heptathlon 100-meter hurdles. 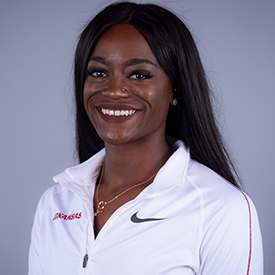 Began her stead as a Razorback with two top-five performances (long jump and hurdles) at the Arkansas Invitational (1/15) … Finished fourth in the 60 hurdles at the Gladstein Invitational (1/22) in 8.39 … Placed seventh in her first collegiate pentathlon at the Razorback Invitational (1/30), scoring 3,868 points … Set two PRs, clearing 1.81m/5-11.25 and running 2:32.24 in the 800 to pace her to a new pentathlon PR of 3,945 points at the SEC Indoor Championship (2/27), good for a ninth-place finish … Kicked off the outdoor season with a win in the long jump at the Arkansas Spring Invitational (3/26) … Made her heptathlon debut at the Texas Relays (4/1), scoring 5,372 points to finish 11th led by solid performances in the 200 (24.43w) and 100H (13.61w) … Improved her heptathlon PR by over 100 points, scoring 5.489 at the John McDonnell Invitational (4/23) … Helped the Razorbacks to a runner-up finish in the shuttle-hurdle relay at the LSU Invitational (4/30) … Set a new personal best in the heptathlon of 5,495 points at the SEC Outdoor Championship (5/13) off PRs in the 200 (23.57) and the 100 hurdles (13.31) … Qualified for the NCAA Outdoor Championship in the long jump, following a mark of 6.24m/20-5.75 at the NCAA West Preliminary Round (5/28) … Closed the year with NCAA second-team All-America and honorable mention recognition for her efforts in the 400 relay and long jump, respectively. Utilized a redshirt for her season on campus. Five Arkansas Meet of Champions titles … Holds four individual state records and one as a member of the Crossett 4-x-100-meter relay … 2013 Arkansas Democrat-Gazettemale High School Athlete of the Year … Jumped to the number two rank in the nation in the high jump during her senior year with a clearance of 6-1 … Ranked number one in Arkansas in the long jump … Arkansas 4A Indoor state champion at 60 meters, 60-meter hurdles, high jump, and long jump … Qualified and placed in the top-three in at least one event all four years of her high school career. Daughter of Maurice and Daphne Herman.